90% of the phone calls we receive at 24 Hour Towing Atlanta are for EMERGENCY services. If you are experiencing an emergency please call the number listed at the top (and bottom) of the screen to be connected to our 24 hour towing service and our 24 hour wreckering service. You can also save time by filling out the electronic form seen on this site and let our award winning customer service department help coordinate your towing service and insurance carrier's policy requirements. We also provide long distance vehicle transportation and use our flatbed wrecker to haul heavy equipment and machinery. Sometimes you encounter unexpected road surfaces and the car can get stuck or otherwise hung up somewhere underneath and it's just impossible to get out. No problem! 24 Hour Towing Atlanta is there for you with the right wrecker service to pull you out! Cars can often find themselves having traveled down a steep grade and in an impossible situation to get back to the road. Let the trained experts at 24 Hour Towing Atlanta get your vehicle back to the road safely and quickly. While we don't get much snow in the Atlanta area, that often means that we are far less prepared for it when it does come. Getting stuck in snow takes place all the time in the winter and when you're in a jam, you can rely on 24 Hour Towing Atlanta to get you out! Back roads containing sand traps, sugar sand, beaches; they all represent hazardous conditions that can sometimes get a car or recreational vehicle stuck. 24 Hour Towing Atlanta has plenty of experience getting vehicles un-stuck, quickly and safely! During unexpected situations, cars can roll into creeks, lakes or other water hazards. 24 Hour Towing Atlanta will use the necessary tools and procedures to recover your vehicle and comply with the demands of your insurance carrier to mitigate the problem! 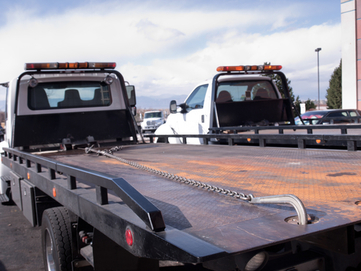 Depending on your vehicle type or accident situation, flatbed wrecker service might be right for you. Our flatbed towing service has also been used to safely move machinery and equipment. Commonly used in the recovery business, these trucks rapidly and safely lift the pair of tires under either the back or front of your car to get you going. 24 Hour Towing Atlanta has these trucks in our fleet ready to serve all your towing service needs. Car and truck accidents can have unexpected damages. The towing professionals at 24 Hour Towing Atlanta will evaluate your situation and dispatch the proper towing vehicle to best match your needs. Our large trucks provide 24 hour wrecker service ready to take on large vehicles like semi's and busses. Batteries sometimes wear out unexpectedly or perhaps someone left an electrical drain on an unattended car. Either way, a jump start can often be a life-saver and 24 Hour Towing Atlanta is all part of our towing service and our wrecker service! It happens when you least expect it. A car door shuts with the lock pushed down and your keys or key fob is locked inside the vehicle. No worries, the experts at 24 Hour Towing Atlanta will come and get those keys out for you in no time! 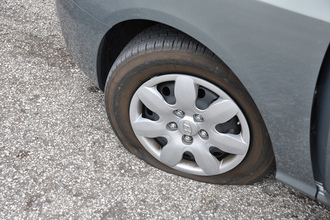 Road debris can be anywhere and the potential for developing a flat tire cannot be discounted. Armed with the best equipment for the job our trucks and drivers can provide you with fast and reliable service to get you back up and running with little delay. It happens; some careless inattention or perhaps a faulty gauge and you suddenly find yourself stranded, out of gas in the middle of nowhere! 24 Hour Towing Atlanta carries extra gas canisters on-board our trucks and will get you going faster than most any other emergency towing service in Atlanta. Our crews take periodic courses from Allstate to stay current on all the best towing practices recommended by the car manufacturers. Cars like Porsche and Lexus often have hidden compartments and panels designed for towing emergencies but without the proper training, the ordinary tow truck driver doesn't know about them. We always do! Larger and heavier than a car, SUV's have their own special needs and at 24 Hour Towing Atlanta, we know them back and forth! Similar to our procedures for SUV's 24 Hour Towing Atlanta will take good car of your light truck or company fleet van. Call our dispatcher now and they will set you up with exactly the right wrecker service you medium truck will require for fast and safe recovery. We are arguably the largest towing company in Atlanta and can handle all the big rigs in any situation or condition encountered. Trailers can often jack-knife, fly off the back of the vehicle they are towed from, blow a tire and spill a load . . . all kinds of unimaginable things! 24 Hour Towing Atlanta operators are experts in getting your trailer either reconnected safely or transported for repair. 24 Hour Towing Atlanta maintains specialized motorcycle towing rigs and are prepared to provide you with the finest motorcycle towing service available. These kinds of vehicles can require all kinds of roadside assistance and our drivers are all certified by Allstate on the most popular manufacturers to deal with all the common kinds of problems. ATV's typically get into all kinds of jams and if it happens to you and you require a towing service in Atlanta, GA for your ATV, then 24 Hour Towing Atlanta is the right place to call! 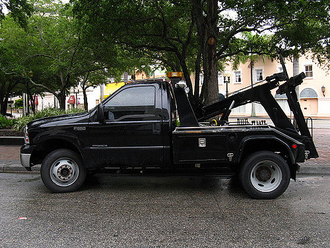 24 Hour Towing Atlanta is one of the Atlanta areas most respected towing companies. So if you're looking for a flatbed towing service or a flatbed wrecker service for any vehicle . . . or you've been searching for "wrecker services in my area," you need search no more. 24 Hour Towing Atlanta is ready to serve your every towing company need. Call our award winning dispatchers at the number on the top (and bottom) of this screen and receive expert help with whatever emergency situation you face. Customers sometimes ask if we can provide cheap towing or even junk car towing. Our towing prices are some of the most competitive in the Atlanta area, so when you seek affordable towing, call us. You'll be so glad you did!